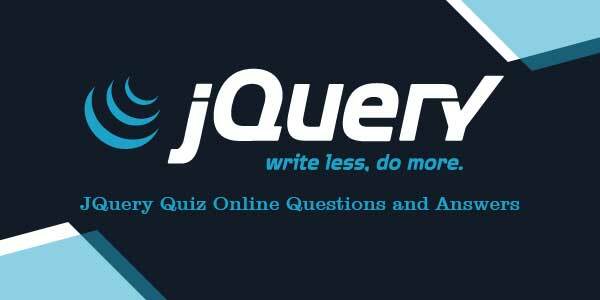 Play below JQuery Quiz Online Questions and Answers with Multiple Choice Questions (MCQs) related to jQuery Framework. You will have to read all the given answers and click over the correct answer to earn points. 9 - .contains() function get the children of each element in the set of matched elements. 4 - ajaxStop() function register a handler to be called when all Ajax requests have completed. 6- .data() function Store arbitrary data associated with the matched elements. 5 - .ajaxDone() function attach a function to be executed whenever an Ajax request completes successfully. 10 - Which function below select all elements that contain the specified text. 1- Register a handler to be called when Ajax requests complete with an error. 7- .style() function get the value of a style property for the first element in the set of matched elements. 2- Attach a function to be executed before an Ajax request is sent.